Kathryn Magnolia Johnson (1878–1955), a high school teacher, worked for the NAACP as a field agent from 1913 to 1916, establishing branches in the Midwest and South. Addie Waites Hunton (1866–1943), a fellow teacher, worked as a NAACP field organizer from 1921 to 1924 and helped arrange the 1927 Pan-African Congress. In 1918 Johnson and Hunton sailed for France as YMCA workers to aid black troops. 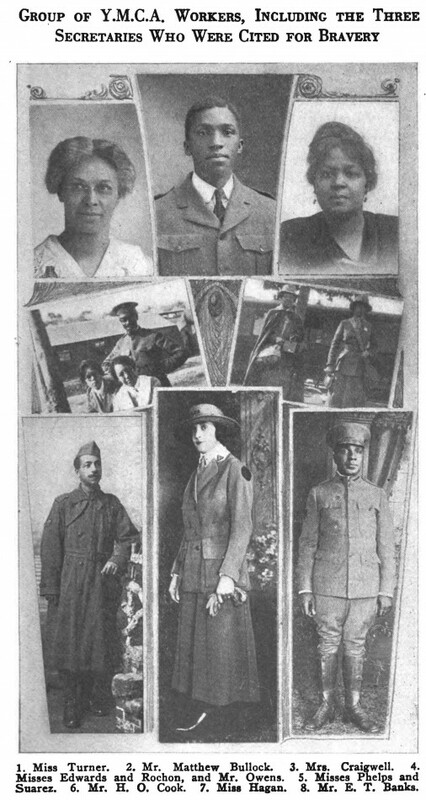 They wrote about their experience in this book, Two Colored Women with the American Expeditionary Forces. The largest Y. M. C. A. hut in France was one built at Camp Lusitania, St. Nazaire, for the use of colored soldiers. It was the first hut built for our boys, and for its longest period of service was under the supervision of Rev. D. Leroy Ferguson, of Louisville, Ky. It reached its highest state of efficiency and cleanliness under Mr. J. C. Croom, of Goldsboro, N. C. It did service for 9,000 men, and had, in addition to the dry canteen, a library of 1,500 volumes, a money-order department which sometimes sent out as much as $2,000 a day to the home folks; a school room where 1,100 illiterates were taught to read and write; a large lobby for writing letters and playing games; and towards the close of the work, a wet canteen, which served hot chocolate, lemonade and cakes to the soldiers. To this hut one of us was assigned, and served there for nearly nine months. The work was pleasant and profitable to all concerned, and no woman could have received better treatment anywhere than was received at the hands of these 9,000 who helped to fight the battle of St. Nazaire by unloading the great ships that came into the harbor. Among the duties found there were to assist in religious work; to equip a library with books, chairs, tables, decorations, etc., and establish a system of lending books; to write letters for the soldiers; to report allotments that had not been paid; to establish a money order system; to search for lost relatives at home; to do shopping for the boys whose time was too limited to do it themselves; to teach illiterates to read and write; to spend a social hour with those who wanted to tell her their stories of joy or sorrow. All of this kept one woman so busy that she found no time to think of anything else, not even to take the ten days’ vacation which was allowed her every four months. In a hut of similar size among white soldiers, there would have been at least six women, and perhaps eight men. Here the only woman had from two to five male associates. Colored workers everywhere were so limited that one person found it necessary to do the work of three or four.ust on the suburbs of St. Nazaire, about two miles from Camp Lusitania, was another hut, the second oldest for colored men in France. Here the other one of the writers spent six months of thrilling, all-absorbing service; while about six miles out, in the little town of Montoir, where thousands of labor troops and engineers had permanent headquarters, the third of the colored women to come to this section ran a large canteen, supplying chocolate, doughnuts, pie and sometimes ice cream to the grateful soldiers. This hut was far too small for the number of soldiers it had to entertain, but it was made large in its hospitality by the genial, good-natured, energetic Mr. William Stevenson, its first hut secretary, now Y. M. C. A. secretary, Washington, D. C. He started the work in a tent, and built it up to a veritable thriving beehive of activity. There were several other localities in the neighborhood of St. Nazaire, where one colored secretary would be utilized to reach an isolated set. They usually worked in tents. Other places where Y. M. C. A. buildings, huts or tents for colored soldiers were located, were Bordeaux, Brest, Le Mans, Challes-les-Eaux, Chambery, Marseilles, Joinville, Belleau Wood, Fere-en-Tardenois, Orly, Is-sur-Tille, Remacourt, Chaumont, and Camp Romagne near Verdun. Rolling canteens ran out from some places, reaching points where the soldiers had no Y. M. C. A. conveniences. This was a small automobile truck, equipped with material for serving chocolate and doughnuts, and operated by a chauffeur, and a Y woman who dispensed smiles and sunshine to the ofttimes homesick boys, along with whatever she had to tempt their appetites. The last, and perhaps the most difficult piece of constructive work done by the colored workers, was at Camp Pontanezen, Brest. There were several other large huts at Camp Pontanezen, that were used for long periods exclusively by colored soldiers; but in the absence of colored women, white women, sometimes as many as five in a hut, gave a service that was necessarily perfunctory, because their prejudices would not permit them to spend a social hour with a homesick colored boy, or even to sew on a service stripe, were they asked to do so. But the very fact that they were there showed a change in the policy from a year previous, when a colored woman even was not permitted to serve them. In nearly all the Y. M. C. A. huts, in every section of France, moving pictures would be operated every afternoon and evening. Many times before the movies, some kind of an entertainment would be furnished by the entertainment department of the Y. M. C. A. There were shows furnished by French or American dramatists; concert parties by singers and musicians of all nationalities, and frequently a lecture on health and morals. The movies and shows were the most popular forms of entertainment, and on these occasions the huts would always be crowded, as all entertainments given by the Y. M. C. A. were free. The organization also did much to promote clean morals among the men, by the free distribution of booklets, tracts, and wholesome pictures. This literature would be placed in literature cases, and the men would select their own material, while the pictures would be placed in parts of the hut where they would be easily visible. Some of the booklets which were unusually popular among the men were “Nurse and Knight,” “Out of the Fog,” “When a Man’s Alone,” “The Spirit of a Soldier,” and “A Square Deal”; while quantities of other stories with sharply drawn morals were distributed by the thousands and thousands of copies. All told, the Y. M. C. A., with a tremendous army of workers, many of whom were untrained, did a colossal piece of welfare work overseas. The last hut for the colored Americans in France was closed at Camp Pontanezen, Brest, on August 3, 1919, by one of the writers; the two of them having given the longest period of active service of any of the colored women who went overseas. Another thing I would not have known except for your informative blog. Thanks so much! @Teri: You’re welcome and my pleasure (really, since you know I love hunting for information *g*). a] “In a hut of similar size among white soldiers, there would have been at least six women, and perhaps eight men. Here the only woman had from two to five male associates”. b] “Large huts at Camp Pontanezen, that were used for long periods exclusively by colored soldiers; but in the absence of colored women, white women, sometimes as many as five in a hut, gave a service that was necessarily perfunctory”. @Hels: African-American participants in WWI saw their involvement as a duty to their country and as a way to show that their loyalty should earn them respect in American society. Unfortunately, this was not the case–segregation and racism was pretty rife between American troops over the course of the war, and the African-American nurses and YMCA workers had to fight to be able to even serve African-American soldiers and officers. The entire book is an interesting read that gives a different perspective on the war. Your info is so very interesting….I am a bit of an historian and although I knew a little about the service of African American workers…. I am doing research on Matthew Bullock Sr. He is in the picture you posted. Where did you find the original?